Beauty box overload this week as I received four in one day! 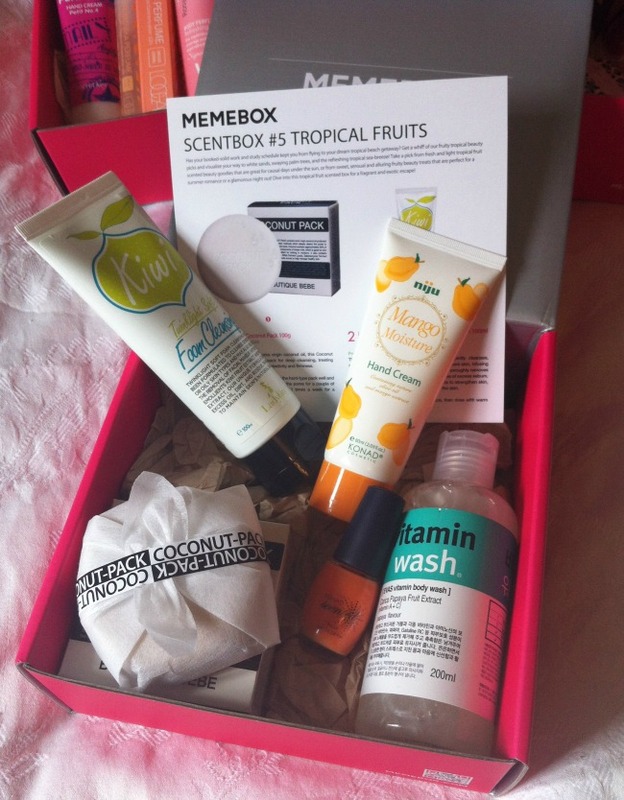 Here are the first three, a bundle of scent-themed boxes from Memebox: Floral, Tropical Fruits and Sweet Shop. These boxes could be bought individually for $15 (£9) plus shipping, but there was a 3 for the price of 2 offer so I went for that. 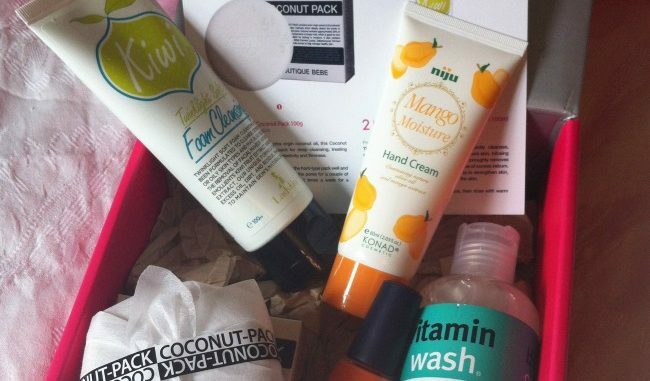 If you haven’t seen them, Memebox are non-subscription beauty boxes from Korea containing a mix of skin care, hair care and make up. The boxes normally take around 5 days to arrive in the UK. 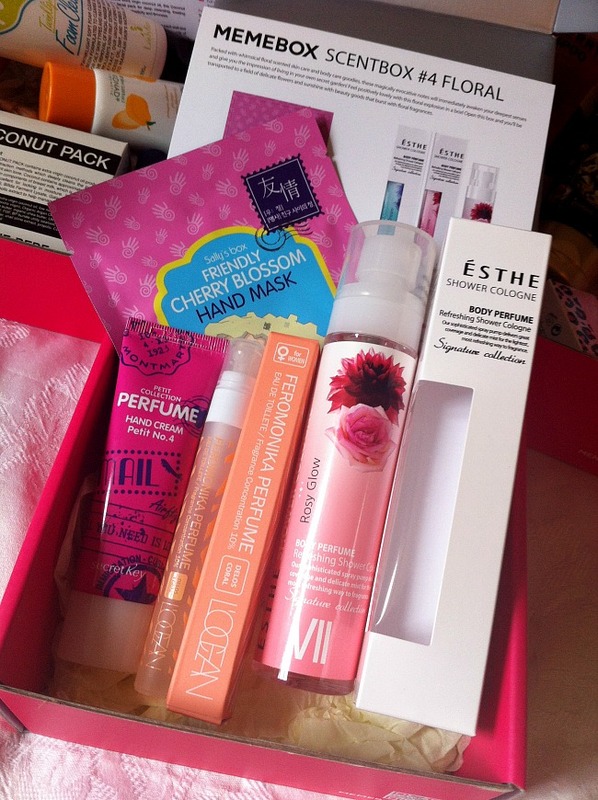 I think they are the best value beauty boxes around right now, although sometimes the contents can be hit and miss. A pair of goop-filled gloves to immerse your hands in for deep moisturising. I like products like this. I thought this was a shower gel but it’s actually a floral body spray/perfume. For days when only smelling like a bunch of flowers will do. With only 4 products in the box, it’s a shame that two of them are perfume and two of them are for hands. I love the look of this cute little handbag sized spritzer but I’m not yet convinced by the smell. Love this brand and already use their lovely toner. I got the pink hand cream scent no.4 which on further research reveals itself to be bergamot peach rose. Hand cream is always useful but I would’ve preferred more variety in the box. Looks like a soap, but it’s not. This is compacted coconut oil for deep cleansing, treating pores and improving skin elasticity. I’ll probably just end up using it like a soap though. Amazingly tropical scent from this cleanser – it’s got kiwis and pineapples and all sorts going on in there, plus tiny green beads like kiwi seeds. Thankfully the scent is from natural fruit extracts rather than anything too artificial. A mango scented hand cream which would probably be amazing had my daughter not stolen it. This is why doubling up of products is not always a bad thing. You paint this on your nails and when it dries it smells like juicy mandarins. Quite a soft, wearable orange coral shade too. This we like. There were six varieties of this and I got Papaya which on first opening doesn’t have the strongest scent. Chucked a load of it in my bath and whilst it did lather up well, it still smelt of mainly nothing. Or maybe that’s what papayas smell like? I don’t know, I never sniffed one. Must put it on my To Do list. There was a tiny sample of this in the Hair & Body 2 box, and it smells amazing, like a fruity hair perfume. Great to receive the full size version. I think it’s, like, the law that every Memeboxer much receive some Hope Girl product at some point. I got the strawberry tinted lip balm which is a particularly scary acid pink but thankfully it applies much paler. Feels a bit random in the box. Two moisturising lip masks, for when you want to look even more stupid in the service of skincare. There are sweets on the packaging but that’s as far as it goes for the theme – there’s no sweetie scent at all. I like these because they’re not something you can get in the UK and they’re a bit fun and daft to use. Useful as a passive-aggressive gift for anyone you want to silence. These scentboxes are amongst the cheapest boxes on offer from Memebox, retailing at $15 each plus $6.99 postage (so $21.99 in total, or £13ish). The bundle was 3 for the price of 2, so full RRP for all of the above was $43.98 (£26.60) including postage. Each box contains $48-$50 worth of goods, so around $146 or £88 in total. I had some discounts so I paid $31.98 (£19.35) for the 3 boxes. I’m happy with that. It’s not utterly amzeballs, and neither is it terrible, but I don’t think I’d order a scent bundle again without a deep discount. A few months of smelling like a flowery, sweetie tropical fruit bowl is probably enough for a lifetime. These boxes are sold out right now, but if you’re after something similar there’s currently a Dessert box, Rose box and Berry themed box up for sale. I’ve ordered the berry box. I bought these boxes with my own money.